Learn about the process of cell transportation and genetic dispositions with these scientific flash cards. Gene A part of a cell that controls the appearance, growth, etc., of a living thing. Allele any of the alternative forms of a gene that may occur at a given locus. Trait A quality that makes one person or thing different from another. Hybrid An animal or plant that is produced from two animals or plants of different types. 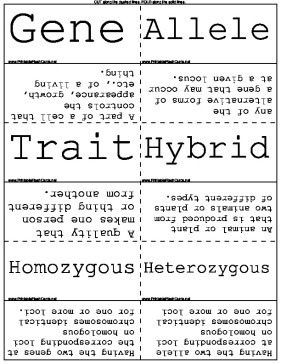 Homozygous Having the two genes at the corresponding loci on homologous chromosomes identical for one or more loci. Transformation A complete or major change in someone`s or something`s appearance, form, etc. Bacteriophage A virus that infects Bacteria. Base Paring To participate in formation of a base pair. DNA polymerase Any of several polymerase that promote replication or repair of DNA usually using single-stranded DNA as a template. Transcription the process of constructing a messenger RNA molecule using a DNA molecule as a template with resulting transfer of genetic information to the messenger RNA. Translation the process of forming a protein molecule at a ribosomal site of protein synthesis. Codon a specific sequence of three consecutive nucleotides that is part of the genetic code. Anticodon a triplet of nucleotide bases in transfer RNA that identifies the amino acid carried and binds to a complementary codon. Mutation a change in the genes of a plant or animal that causes physical characteristics that are different from what is normal. Selective breeding Intentional breeding for a specific characteristic. Genetic engineering the science of making changes to the genes of a plant or animal to produce a desired result. Polymerase chain an in vitro technique for rapidly synthesizing large quantities of a given DNA segment that involves separating the DNA into its two complementary strands.